FotoAngelo is an application by ACD Systems.which allows you to add sound, text and transition effects. Simple tools like the image ordering drag-and-drop storyboard area, make creating shows with this multimedia builder quick and easy . Update : FotoAngeloProduct has come to an end, It is recommended to use ACDSEE instead. Installation is simple and guided.After you are done with installation part, Launch FotoAngelo, and choose “Create a New Project”Now you get the main window, Which looks like as shown here, different fields are Highlighted in order to explain their use. 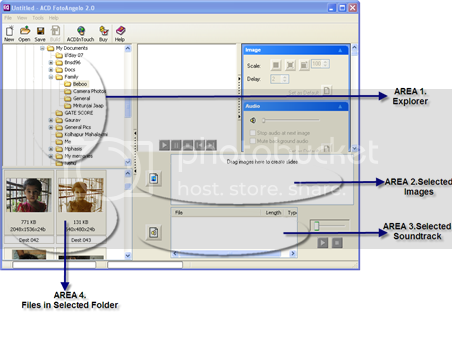 Drag and Drop the image files (*.png, *.bmp, *.gif, *.jpg) in AREA 2, select folder from disk using AREA 1(Explorer), and select files to be used from AREA 4. Drag and Drop the audio files, (*.WAV, *.mp3, .WMA, .rm etc formats are not accepted) in AREA 3, using AREA 1 and Area 4. 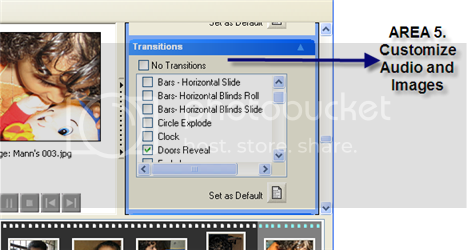 Now the transitions, delays, size of images, audio properties, text formatting can be specified using AREA 5. Here every image file is required to be customized individually, and text too is to be selected individually for each image. Now as all the foundation work is done, here you go, just click on the “Build” button of main window, click “Next”, use radio button to make a choice between Screen saver and Slide show, in case of Screen saver, you can choose to create the installer for it as well, using check box. Clicking “Next” you can specify the resolution of images, click “Next” to specify the location for the new file being created. If you have opted for Slide show, it may ask for few more, self defined options, choose your requirements, and move further. Now the file is ready to be used, install the screen saver and now you can watch your loved ones with a dedicated song for them, which has an ability to make you smile and set you recharged, even while you are under tremendous work pressure, this is the feature which made me a fan of this software. Hope it works same for you too.